"Across Mars" won a judge's award-the painting is also for sale so please inquire if interested! It's one of my popular long landscape paintings done on a long thin canvas. 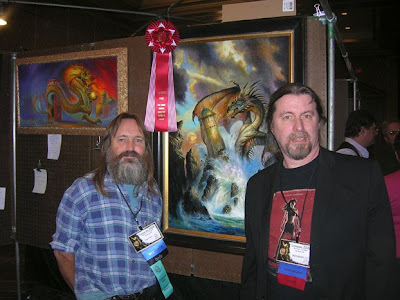 Lunacon Author GoH Dave Freer and me with the painting I did for his upcoming book DRAGON'S RING(I'll do a step by step demo on this soon!) He was so happy with this piece he gave it his "Author Guest" ribbon you see there. And not because it was his cover! The finished drawing-see previous post-that was done in a couple of hours. Again, it's for sale so please inquire if interested!! UPDATE-this drawing sold to a collector in France! Sorry! (This photo courtesy Donato) Me working on a drawing. This is becoming a fun tradition. 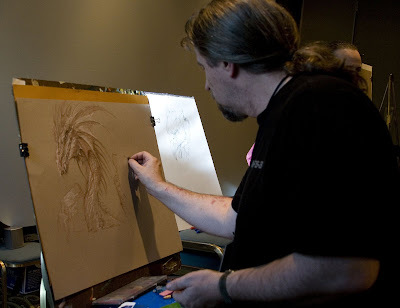 Donato Giancola always does informative demos at conventions and, I've done them as well. 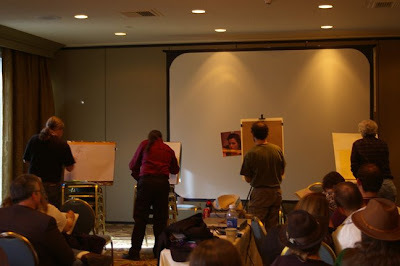 So for Lunacon, we always have "Evolution of a Drawing" which the audience watches us artists draw and show how the basis of an idea comes together. Questions and general banter are encouraged by the audience and between the artists. It always works out fun and informative for both audience and us. And it does take alot out of us after a two hour session. Donato does a good job of hosting it and explaining basically what's going on. Too long since I should have posted anything! Oh well, that's life. Lunacon, this past weekend was great. A good time with good friends more than anything. Lots of fun was had talking to some of the other artists I usually do not get time to speak much to! 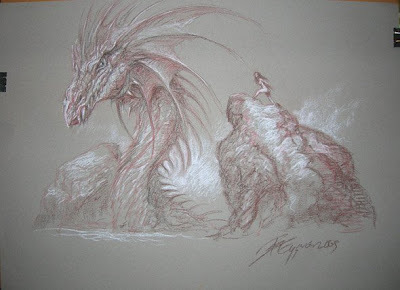 I did a drawing session with Donato Giancola, Larry Dixon and Tom Kidd and drawing, and talking is always fun to do. The hotel is also great-we call it "The Escher Hilton" because of it's various back hallways, secret exits and how the 8th floor is on the same level as the 4th floor and connected with the mysterious "Interdimensional Corridor". Other news-I'm busy as ever on work. I will post a new "in progress" series coming up. I am also working on a Stephen King project, and, I got something into the 16th volume of SPECTRUM which, considering I have been in each volume but two, since 1993, it's quite a feat. Oh, and I am nominated for a Hugo Award for Best Professional Artist, a bit of good news in a winter that having seen the deaths of friends, and my mother, bodes for a better Spring. We can hope. Thanks for hanging in there with me. I am so busy it's kind of scary in a good way. I have several private commissions, six bookcovers, and two book projects and a gallery show all working me well into this year. It's a good place to be in despite it is a matter of just getting the "ducks in a row" as it were. To artists, my advice is, diversify and do lots of different things. I learned this also from my friend John Davis, and his various scripts, ideas and so on-have lots of irons in the fire. The people who have suffered badly in this Recession are, the people who relied on one and only one specialty thing. I worked my last "9 to 5 job" in 1983 and have been so busy since, I haven't looked back. Hence it's why no time to do some small works of late. As I get beyond the shock of Mum's passing, I'm emerging into a better outlook and a positive view. I know she's up there looking in on me, I have no question of this. SO I have to climb the mountain but I think the view from there, will be spectacular. I usually don't get political but here goes. I love President Obama. He's everything I'd hoped for-he's not perfect, and he's not a messiah.... but the man is a thinker. And in polls, it appears I'm in the majority. Today he reversed the backward Bush policies about Stem Cell Research, and has re-iterated his push to get SCIENCE back taught in schools and on the front burner. The unfortunate problem with the past 8 years has been the fact that ideology has replaced common sense. People who wave the Bible and twist words around to being some kind of "sacred word of God" decided that ideology should be national policy. Ditto war because they read some old words and twisted them into some kind of "prophecy". These are morons who believe the earth is flat, and that the earth is only about 4 to 6000 years old. Sad that people live like that, they must like simple ideas in their minds.. I got accosted in Borders books by some idiot wanting me to "come and read the Bible" with him. Got news for him, I've done that. It's a nice mythology, oral history if you will, but it's not about God(if that's what you believe in). These are backward people, and backward people are what will doom the future, they listen to Rush Limbaugh-who they don't realize is merely an entertainer with no interest, other than funding his own drug habits with his bloviating on radio "Dear! It's Rush Limbaugh on the radio! HE can tell us what to do!". These are people who need to be told what to do. They they'd rather be sheep, than people who blaze their own trails. Thomas Jefferson, Ben Franklin and Mark Twain(my hero) all had quotes for the dangers of mixing ideology, with politics. So, bravo for science, and for President Obama. And a good day for Common Sense. We've taken a great step forward for Mankind. God would be proud. I'm still here, I'll have more things kicking in soon blog wise. It's been a winter of Hell emotionally, so that's really slowed me down. But I may be very sporadic in the coming weeks, but I'll be back to things after that.